This quilt was conceived and completed in three and a half years by over fifty members of the Pensacola Quilter’s Guild, donating over 4200 hours to bring the project to fruition. It was presented to NMNA on June 6, 2006. 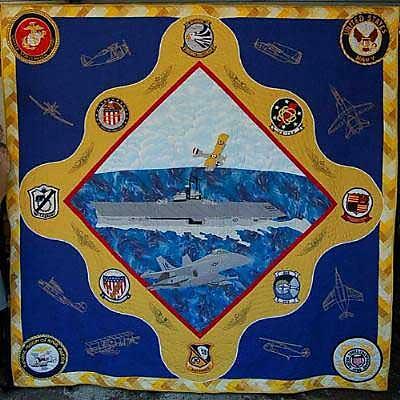 This art quilt was designed and crafted as a tribute to the men and women of the U.S. Navy, Marine Corp, and Coast Guard aviation. They serve their country’s aircraft with dedicated service to ensure the safety of all citizens of the United States of America. We also salute the National Museum of Naval Aviation for preserving this aviation history for future generations. When I first conceived of donating a quilt to the National Museum of Naval Aviation, I knew that as a guild we could create a fitting tribute to the men and women involved in naval aviation. But I must say that the finished quilt surpassed all of my expectations. The craftsmanship is extraordinary, and I was so proud to present this stunning work of art to the museum. Those associated with the museum were amazed by and so very grateful for this generous gift. So many guild members participated in completing this quilt, and I thank you all from the bottom of my heart. I want to particularly thank Donna Barbarick for coordinating the effort in my absence. Truly each and every member of the guild should feel as proud as I do to be associated with this amazing project. I hope you’ll all visit the quilt once it is hanging in the museum.